Professional PowerPoint recovery software that easily fixes corrupt MS PowerPoint (.ppt/.pptx/.pps) files to recover all inaccessible PowerPoint data. The toolkit efficiently restores various PowerPoint objects, such as Text, Tables, Header and Footer, Charts, WordArt objects, etc. The only solution to above problems is SFWare Repair PowerPoint File. 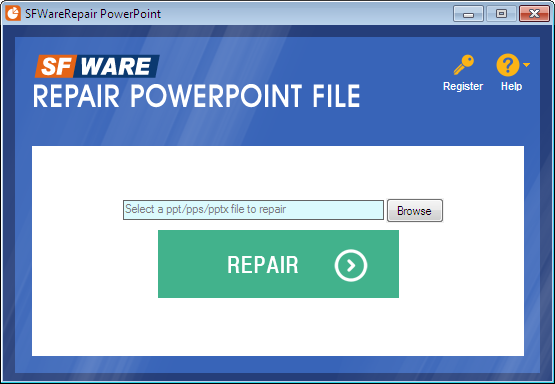 SFWare Repair PowerPoint File is a handy application to handle PPT and PPTX file corruption due to any above mentioned reasons. While repairing, this application reads the broken Presentation file and creates a virtual structure by extracting all the elements of a PPT/PPTX file. After the completion of fixing process, it is possible to have a view on all repaired presentations which helps in analyzing the repair level. The Software is designed using advanced algorithms that not only just fix presentation file, but also recovers all the slides present on PowerPoint file with text, formatting, images, animations, sounds, tables, hyperlinks etc. Repair and recovers MS PowerPoint files stored on hard drives, external hard drives, USB dries etc. Kindly note this: What if you find any issues while repairing PowerPoint file? If so, then you can contact our technical team to solve any issues with regards to the product at any time. 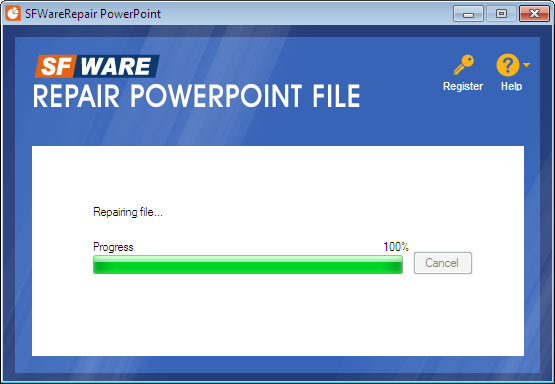 Step 1: Download and install SFWare PowerPoint File Repair software. Step 2: Run the software by following the on-screen steps. Step 3: Browse to select the corrupt PPT/PPTX/PPS file to repair. Step 4: Click the Repair button to start the scan process. Step 5: As the repair process ends, a window will prompt showing that repair was successful. Step 6: Now, select the destination location or drive to store the repaired PPT file. Do you want to fix corrupted PPT, PPTX files? 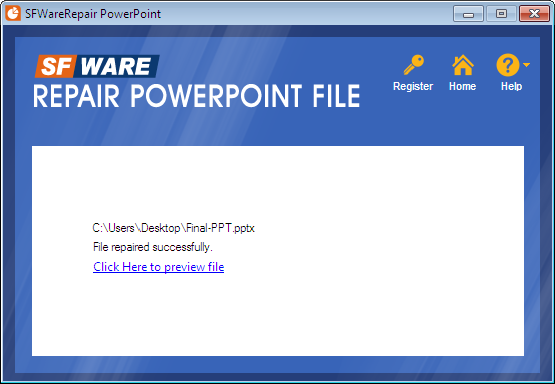 Then make use of SFWare Repair PowerPoint File Software to mend corrupt or damaged PPT files with few simple clicks. How to Fix PPTX Files? Want to repair broken PPT file? Well, SFWare Repair PowerPoint Tool is considered as the most relevant application that can be utilized to open broken PowerPoint file within a fraction of few minutes. Do you want to repair PowerPoint 2013 file at home? Then this software will help you out by fixing all types of issues related to PowerPoint file in few simple clicks. Install Demo version now and fix all PPT or PPTX file! Retrieve different media files from internal and external memory of Android OS devices using Android recovery software on your PC. Make use of simple steps involved in SFWare OST to PST Conversion to turn your unreadable OST file into a healthy usable PST file on Windows Operating System.